Easy to put together, and goes well with crackers, veggies, or even on bread. A great dish to bring to a pot luck or a family gathering. I love that you can put this together ahead of time and warm up when you are ready to serve. Looking for more great recipes for cheese spreads? Be sure to take a look at some of these. 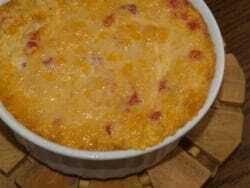 Baked Pimento Cheese Spread tastes so good. Mix together, spoon into greased 1 1/2 quart baking dish. (I have an oval corning dish I've been using) as it makes quite a bit. Bake 20 minutes on 350 degrees. Loved this dip! I brought it to a party, and it at G-O-N-E!